On a typical, bipartisan Friday night in Ohio, Mark Zuckerberg did a totally normal human thing that anyone definitely not awkwardly going about testing the waters for a major political run would: he had dinner with a family, who didn’t know him or that he was coming, at their house. 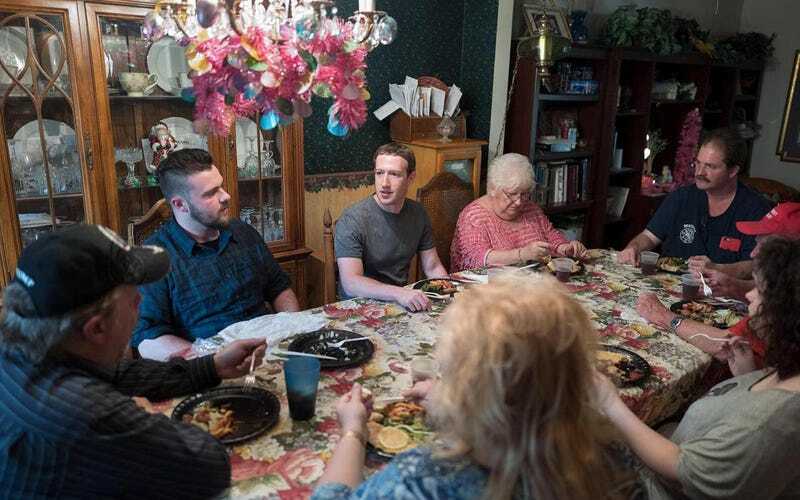 The Youngstown Vindicator reported on Saturday that the Newton Falls family only knew they were to receive a “mystery guest,” and were pleased when it turned out to be the founder of Facebook in a slate-colored t-shirt. This sort of thing will probably keep happening (I mean, aside from the fact that everyone already does it), because, in January, Zuckerberg challenged Zuckerberg to meet people in every state and talk to them about the future. This reminds me of the time, on Thursday, when Zuckerberg announced that he’d conversed with a group of auto-workers at a Ford assembly plant in Detroit who perform 10 hours of physical labor a day, doing the same thing again and again, and love it, but they could really use more shoes! And less capitalism.